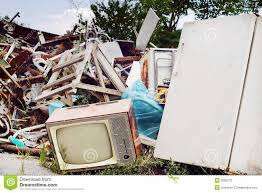 Free Bulky waste service from Nottingham city council, you can use as often as needed. I used it 4 times last year simple book online or over the phone tell them what it is, put outside and cover it up. They will give you a day for removal. Hey presto gone for free (well included in council tax at least) Full list of what they will and wont take is in the link. Useful that they will take old fridges and freezers as they are hard to dispose of responsibly. You do need to be on the electoral roll. Brilliant, I think I'll post a deal about my bins being collected FOR FREE! This is for things like sofas and fridges which the binmen will not take and people pay to have removed or have to take to the tip at their own cost and the hassle involved. Not all councils do this for free and most charge for it, but you knew that already. Do they take Nuclear Waste? Depends which area you live in (£23 where I am!). Useful heads up for those in Nottingham. Will they collect from Hampshire? This is a brilliant deal. Our council charges £30 For two items. £35 per collection on the Isle of Wight. Great deal. Edit: was free a few years ago, just checked again, £32. I can't vote hot for this. This should've been free in the first place, it's what we pay council tax for. I understand capping it at maybe 3 or 4 times a year for large items but it should be free, in every borough! I can't vote hot for this. This should've been free in the first place, …I can't vote hot for this. This should've been free in the first place, it's what we pay council tax for. I understand capping it at maybe 3 or 4 times a year for large items but it should be free, in every borough! The blame lies rather higher up than your local council. Ditto library closures, and a hundred other services that are being cut to the bone. But what's the point of the deal? Other councils don't get it and Nottingham does so... move to Nottingham? well done Nottingham county council. Wish Brent take heed, all this fly tipping is a result of having to pay for waste collection of this type. You have to take it when fly tipped so why not take it on your own terms. If only City of York Council did this, there wouldn't be so much fly tipping. I can't remember the cost for bulky items but I know for a fridge or freezer it is £26 per item to dispose of. But what's the point of the deal? Other councils don't get it and …But what's the point of the deal? Other councils don't get it and Nottingham does so... move to Nottingham? This should be good at combating those people who inhabit an area of ground for a short time, and use it as a base for a short term cash-in-hand waste removal business. Great deal for Nottingham I sincerely hope will will Stop Washers/Fridgers/Settees being dumped in Beauty spots. Rest of the country should follow suit. The blame lies rather higher up than your local council. Ditto library …The blame lies rather higher up than your local council. Ditto library closures, and a hundred other services that are being cut to the bone. The cost of collecting a pre-determined quantity/size/time/location must surely be far less than the cost involved in finding and fishing the same objects out of a ditch, and performing cleanup. I'm also amazed that there are charges for such as the garden waste, being that this disincentiveises non-landfill and recycling. Which means higher landfill costs and penalties, while less potential income from the 'product' (albeit with som money from the residents instead). I wish my council did this. My council doesn't even recycle plastic! Our metal items get picked up without even ringing the council, must be the metal fairies. I'm not sure how good a deal it truly is. Councils up and down the country are complaining about lack of funding, yet some councils have a surplus that they can offer this service! Perhaps they could manage there budgets better. Great deal for those people who live in the NCC, but if you live in broxtowe, rushcliffe, gedling councils etc its a no go. you have to pay. I've debated wheeling my stuff to a friends house 2 roads away.